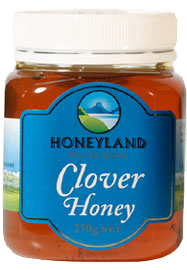 and finally there is Clover honey, a significant feature of the agricultural pasture lands. 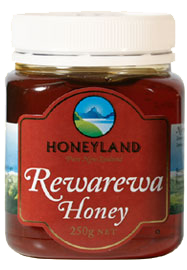 Find out more about our Rewarewa Honey Find out more about our Manuka Honey Find out more about our Clover Honey To find out more about Honeyland’s Tawari, Kamahi, Pohutukawa, Blue Borage and Thyme honeys please contact us. Colour is amber but when the liquid honey is held up to the light it has a distinctive reddish tinge. It has a reading of 85–95mm on the Pfund scale (which measures from 0mm, colourless, to 140mm, black). Flavour is smooth, malty and complex, with overtones of dried fruit. Aroma is intense, slightly smoky, forest hints. Low moisture content (14-16%) gives the honey a dry silky texture. This honey is slow to granulate and when left naturally it forms large crystals. The pollen grains are large, designed for bird pollination. The structure of the flower, with the pollen-bearing anthers being quite separate from the nectarines, means that as the bees gather the nectar they seldom collect the pollen. Thus the Rewarewa honey has a low pollen representation. Colour is dark, measuring 85–105 on the Pfund scale (which measures from 0mm, colourless, through to 140mm, black). Rich in minerals, which can be measured in terms of its conductivity. Flavour is intense, herbaceous, earthy with a distinctive mineral after taste. Aroma is strong, aromatic and heather-like. Some Manuka Honey has antibacterial properties additional to the honey’s usual Peroxide Activity, and this is called ‘Active Manuka Honey’. This is packed under the licensed trademark UMF® which stands for ‘Unique Manuka Factor’. 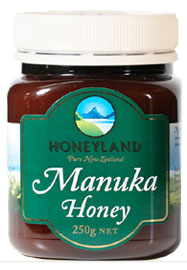 Honeyland produces a range of UMF® Manuka Honeys. Thixatropic, having a thick, jelly-like quality related to the presence of a protein similar to the egg white. This makes the honey difficult to extract from the cells of the honey comb. Colour ranges from very light, almost colourless like water, to a pale gold colour, depending on soil and climatic conditions. It can vary from 0-60 on the Pfund scale (which measures from 0mm, colourless, to 140mm, black). Lighter clover honey comes from the south of the South Island. Flavour is clean, mild, sweet and delicate. Aroma is suggestive of dry grass, with a hint of plums. An ideal honey to add to hot drinks, such as tea, coffee and herbal teas, and to use in delicate tasting bakery. This honey has been the traditional mainstay of New Zealand beekeeping, setting the standard for all other honey.